Toky Agent: Email of the Toky agent who makes or receives the call. Date of the Call: Date and time of the call. From Number of the Call: Inbound, the caller id of the incoming call. Outbound: the Toky number you made the call from. To Number of the Call: Inbound, the Toky number where the call was received. Outbound, the number the agent dialed. Duration of the Call: Duration of the call in seconds. Record Url in Toky Web: Contains the URL of the call recording in Toky web. This field will be empty if this feature is disabled in Toky. Record Url of File on Cloud Storage: Contains the URL to the recording of the call file. You can use this URL if you want to access the file directly. This field will be empty if the recording of calls is disabled in Toky. You can use this URL for file download actions. Toky Phonebook Name of Caller or Callee matched from Number: When the phone number exists in the Toky's Phone directory, returns the contact name. Web Caller Name: The name of the caller when using the Toky widget. This value comes from a form in Toky widget; not all calls contains this data. From Number of the Call in E.164 format: For inbound calls, it's the source number for the calls in international format. Web caller Country: The country of the caller when using the Toky widget. This value comes from a form in Toky widget; not all calls contains this data. Toky Phonebook Email of Caller or Callee matched from Number: When the phone number exists in the Toky's Phone directory, returns the registered email. Web Caller Email: The email of the caller when using the Toky widget. This value comes from a form in Toky widget; not all calls contains this data. Web Caller Phone Number: The phone number of the caller when using the Toky widget. This value comes from a form in Toky widget; not all calls contains this data. 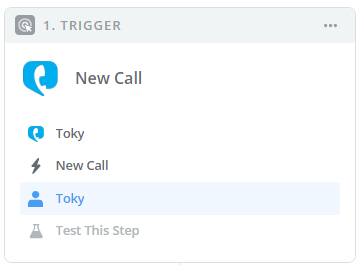 Web Call: It's yes or no depending on if the inbound call was made or not from the Toky's widget. Id of the Contact in Toky Phone Directory: When the phone number exists in the Toky's Phone directory, returns the registered email.